Dr. Edith Blondel-Hill trained at the University of Alberta, Edmonton, Alberta, Canada and received specialty training in internal medicine, infectious diseases and medical microbiology. She started her career at the Royal Alexandra Hospital in Edmonton as an infectious diseases consultant and medical microbiologist and moved to Dynacare Kasper Medical Laboratories in 1997. She moved to British Columbia in 2003 where she worked as a microbiology consultant at BC Children’s Hospital in Vancouver until 2008. She is currently the microbiology consultant for Interior Health and is located at the Kelowna General Hospital in Kelowna, British Columbia. She has a long interest in antimicrobial utilization, chairing various antimicrobial advisory committees in Alberta and British Columbia as well as being involved in guideline and policy development for antibiotic use and prescribing. 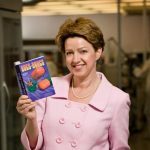 She is co-author of the Bugs and Drugs – Antimicrobial Reference Book and the medical director of the Do Bugs Need Drugs? program, an educational program to address antimicrobial resistance. Her major interests include mechanisms of resistance and susceptibility testing. The Do Bugs Need Drugs? program continues to be an important health initiative in BC. Since its inception, 25000 grade 2 children, 5000 children in day care, and 6000 health care professionals have received educational components of the Do Bugs Need Drugs? program, the majority of phy­sicians’ offices have received materials, and most British Columbians have come into contact with the media campaigns. The upward trend in the use of antibiotics seen from 2003 to 2005 has been arrested and encouraging de­clines in pediatric use are observed. BC physicians are more likely than Canadian physicians overall to prescribe no antibiotic for several common respiratory tract infections or to use first-line antibiotics if doing so. Nevertheless, due to the growing resistance of bacteria to macrolides and fluoroquinolones, decreasing their use continues to be a main objective of the program. In this issue of BCMJ you will find an order form for program materials. Information for physicians is also posted at www.dobugsneeddrugs.org.